Fashion week showed up in Minnesota at the end of April and this was my first time attending the fashion shows. 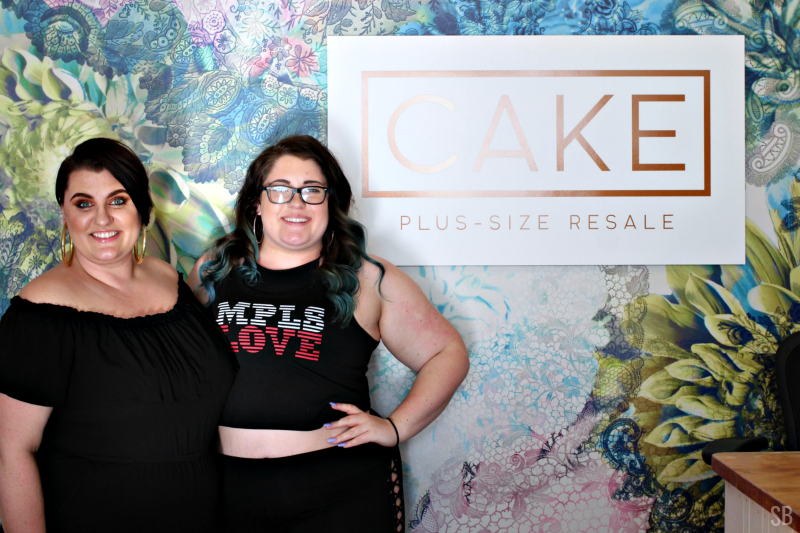 Unfortunately, I was only able to attend one so I chose the Cake Plus Size Resale Fat Festival Fashion show. Owner of Cake Plus Size Retail Cat Polivoda and assistant. 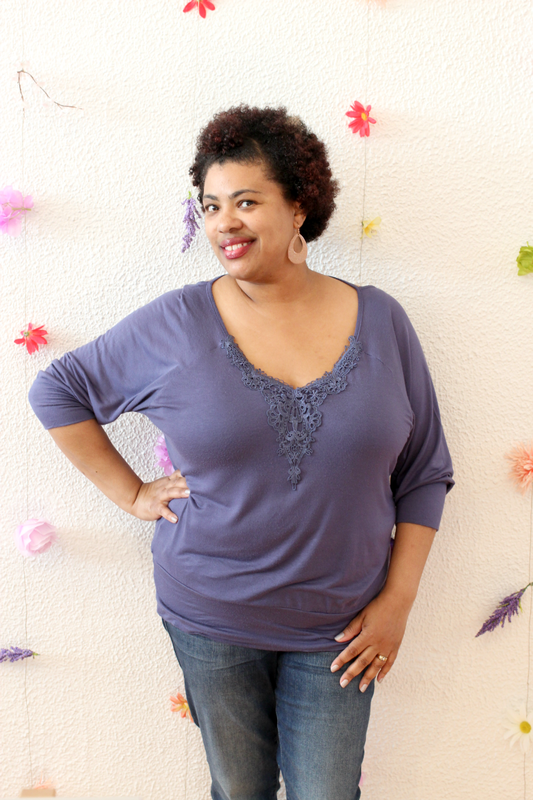 The newly opened store on 51st and Bloomington Ave., South has sizes from XL - 4XL plus. They buy clothing upfront too which is a nice way to get some extra cash or money to shop with at Cake. 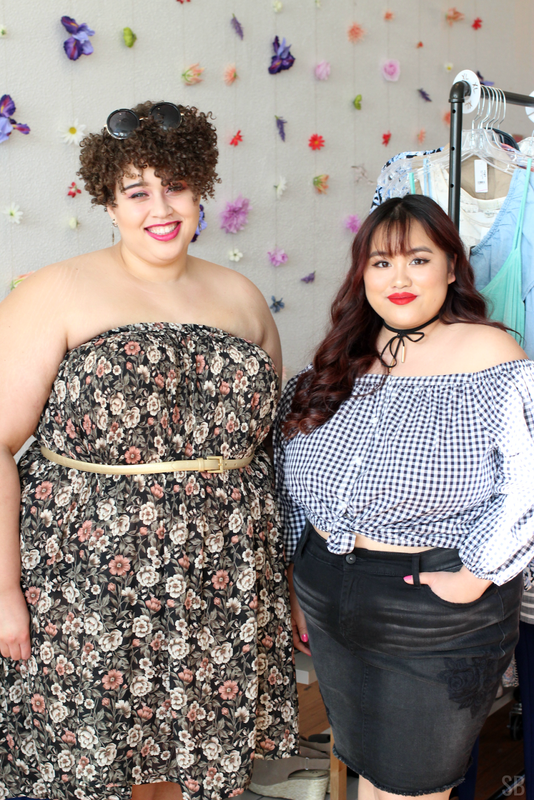 The Fat Festival Fashion pop up shop was all about the Summer festival season where they showed off plus size looks inspired by local music festivals. 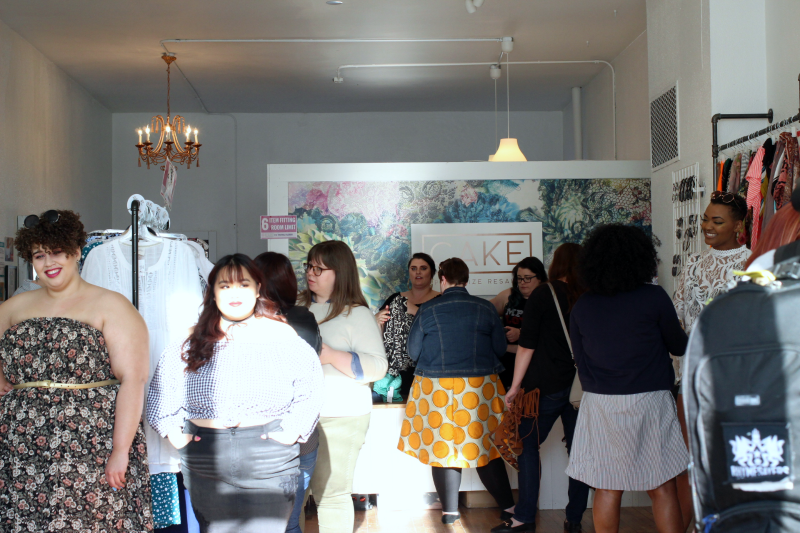 The event was full of live models displaying plus size outfit ideas that are perfect for summer. There was even a food truck outside and plenty of summer tunes playing in the air. The place was buzzing with women of all shapes and sizes finding festival fashion just for them. 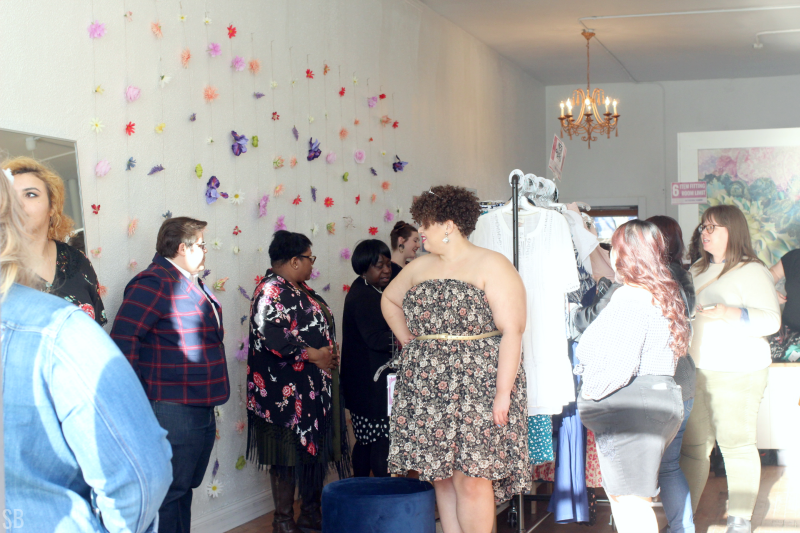 Local bloggers modeling for the Fat Festival Fashion show. Of course, I had to get a picture in front of their oh so cute Instagramable flower wall. 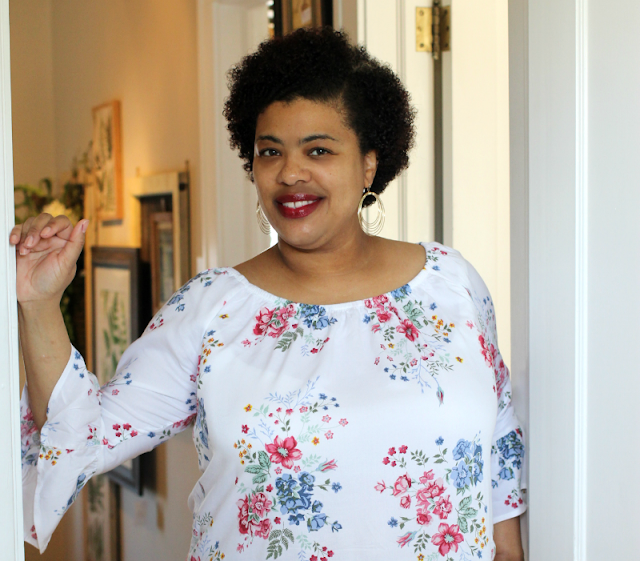 I would definitely recommend this plus size consignment shop to anyone looking for stylish plus size fashion that's affordable. I found a $10 pair of faux leather pants that I have been wanting to add to my closet so you know I will be back! Looks like a fun day and I love that Instagram wall! So cute. I want a wall like that in my house lol! I am loving the fact your models are showing some skin. I am still working on confidence to show my arms without issues. I will see what you have to fit me. The size variety is great. Yeah, I don't think I'd show my tummy but good for them! I love a good pop up shop! And it's cool they let people also sell clothes for instant resale. Hope you had fun! I plan to do some resaling myself. Looks like such a cute event. I would definitely attend one if they came to Atlanta. Looks like there were some cute looks there. They had a lot of cute stuff there. I always shop consignment shops because sometimes what you’re looking for you can’t find specifically in the store. With that being said, this looked like a nice event and I would love to shop here!!! I loved seeing their body positive message. Looks like a fun time. Pop up shops are pretty cool. Some of the pieces in the photos looked cute for the current season. I especially like the long kimono with shorts and the dress. What an amazing event! Thank you for sharing the lovely photos. They have an amazing selection of clothing. I love a good consignment shop. Looks like you had a beautiful time and I love the flower wall too! You get to attend some of the best stylish events. I love that all of the women were a variety of sizes. Very inspiring! 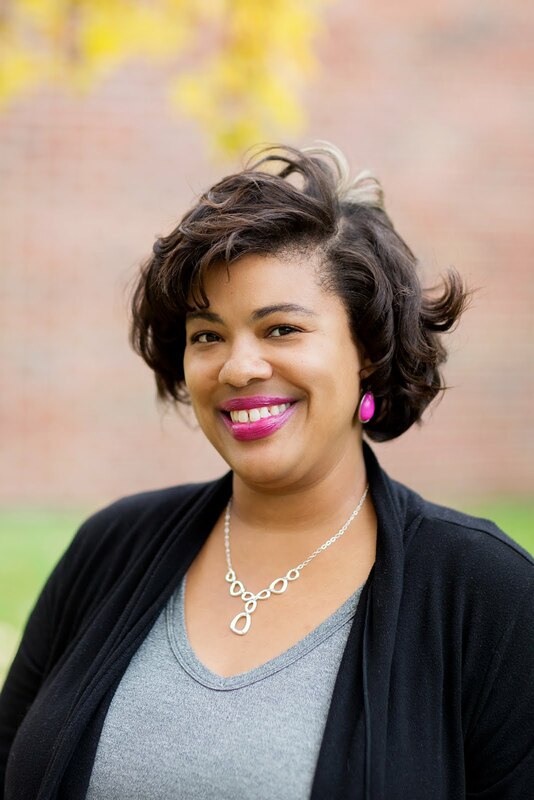 Looks like it was a fun event Stacie! I'm not sure I'd ever be confident enough, but it is so great seeing all the ladies and their confidence is inspiring... Maybe one day! Looks like this shop have so cute outfits! I love the set up. Looks like an awesome event.